Saturn July 19, 2016 02:21 UT. Dia. 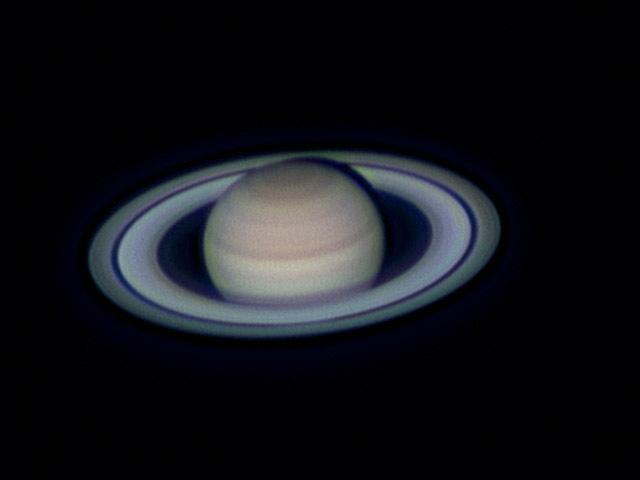 17.9"
Saturn July 18, 2016 02:40 UT. Dia. 17.9"
This image was taken about 9:40 PM local time under good seeing conditions (6/10). Four minutes of each channel (RGB) was collected with a 60% histogram fill factor. This image was made with a C14/CGE Pro, Chroma Technologies LRGB filters, TeleVue 2.5x Barlow and ASI174MM camera. FireCapture was used for camera control and video recording under the Windows 10 OS. Autostakkert 2 was used for selection, alignment and stacking (1.5x drizzle). Registax was used for wavelet processing. RRGB combination was done in Photoshop 5. Final processing and RRGB composition was done in Photoshop CS5. Click on the image to see a larger version. Saturn July 27, 2015 02:50 UT. Dia. 17.4"
This image was taken about 9:50 PM local time under poor seeing conditions (4/10). Five minutes of each channel (RGB) was collected with a 50% histogram fill factor. This image was made with a C14/CGE Pro, Chroma Technologies LRGB filters, TeleVue 2.5x Barlow and ASI120MM camera binned 2x. FireCapture was used for camera control and video recording under the Windows 7 OS. Autostakkert 2 was used for selection, alignment and stacking (3x drizzle). Registax was used for wavelet processing. RGB derotation/registration and combination was done in WinJupos. Final processing and RRGB composition was done in Photoshop CS5/Topaz. Click on the image to see a larger version. Saturn July 14, 2015 03:06 UT. Dia. 17.8"
This image was taken about 10:06 PM local time under average seeing conditions (5/10). Four minutes of each channel (RGB) was collected with a 50% histogram fill factor. 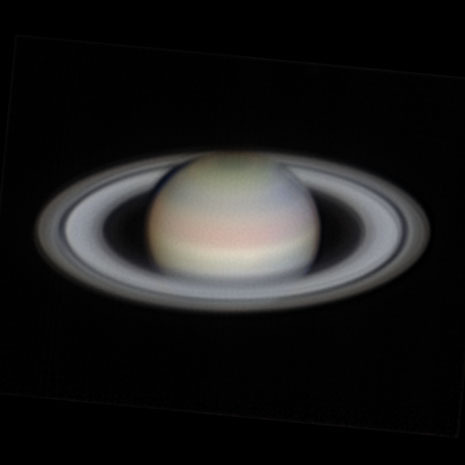 This image was made with a C14/CGE Pro, Chroma Technologies LRGB filters, TeleVue 2.5x Barlow and ASI120MM camera. FireCapture was used for camera control and video recording under the Windows 7 OS. Autostakkert 2 was used for selection, alignment and stacking. Registax was used for wavelet processing. RRGB derotation/registration and combination was done in WinJupos. Final processing was done in Photoshop CS5/Topaz. Click on the image to see a larger version. Saturn July 13, 2015 02:54 UT. Dia. 17.8"
This image was taken about 9:55 PM local time under good seeing conditions (6/10). Four minutes of each channel (RGB) was collected with a 50% histogram fill factor. This image was made with a C14/CGE Pro, Chroma Technologies LRGB filters, TeleVue 2.5x Barlow and ASI120MM camera. FireCapture was used for camera control and video recording under the Windows 7 OS. Autostakkert 2 was used for selection, alignment and stacking. Registax was used for wavelet processing. RRGB derotation/registration and combination was done in WinJupos. Final processing was done in Photoshop CS5/Topaz. Click on the image to see a larger version. 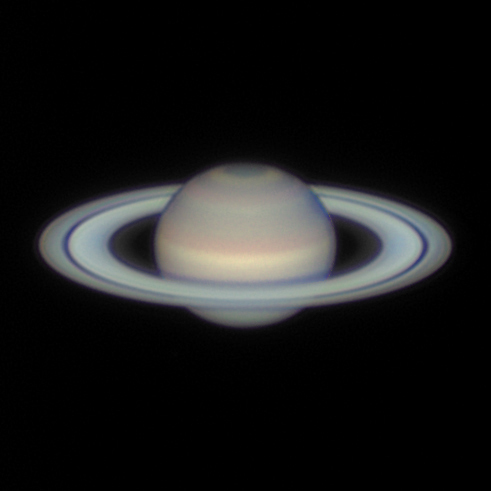 Saturn June 26, 2015 03:15 UT. Dia. 18.2"
This image was taken about 10:15 PM local time under average to poor seeing conditions (5/10). Four minutes of each channel (RGB) was collected with a 50% histogram fill factor. This image was made with a C14/CGE Pro, Chroma Technologies LRGB filters, TeleVue 2.5x Barlow and ASI120MM camera. FireCapture was used for camera control and video recording under the Windows 7 OS. Autostakkert 2 was used for selection, alignment and stacking. Registax was used for wavelet processing. RRGB derotation/registration and combination was done in WinJupos. Final processing was done in Photoshop CS5/Topaz. Click on the image to see a larger version. Saturn July 24, 2014 02:00 UT Dia. 17.3"
﻿This image was taken about 9:00 PM under good seeing conditions (6/10). Three minutes of each channel (RGB) was collected with a 50% histogram fill factor. This image was made with a 12" LX200GPS, Astronomik LRGB filters, TeleVue 2.5x Barlow and ASI120MM camera. FireCapture was used for camera control and video recording under the Windows 7 OS. Autostakkert 2 was used for alignment and stacking. Registax was used for wavelet processing. RRGB registration and combination was done in Photoshop. Final processing was done in Photoshop CS5/Topaz. Click on the image to see a larger version. 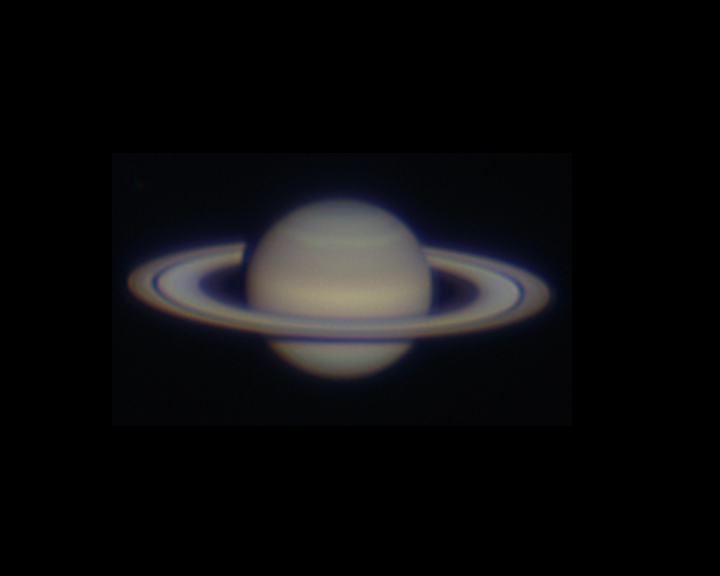 Saturn July 21, 2014 02:00 UT Dia. 17.4"
This image was taken about 9:00 PM under very good seeing conditions (8/10). Three minutes of each channel (RGB) was collected with a 50% histogram fill factor. 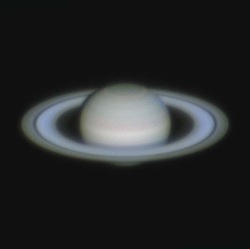 This image was made with a 12" LX200GPS, Astronomik LRGB filters, TeleVue 2.5x Barlow and ASI120MM camera. FireCapture was used for camera control and video recording under the Windows 7 OS. Autostakkert 2 was used for alignment and stacking. Registax was used for wavelet processing. RRGB registration and combination was done in Photoshop. Final processing was done in Photoshop CS5/Topaz. Click on the image to see a larger version. Saturn July 14, 2014 02:00 UT Dia. 17.6"
This image was taken about 9:00 PM under very good seeing conditions (8/10). Three minutes of each channel (RGB) was collected with a 60% histogram fill factor. This image was made with a 12" LX200GPS, Astronomik LRGB filters, TeleVue 2.5x Barlow and ASI120MM camera. FireCapture was used for camera control and video recording under the Windows 7 OS. Autostakkert 2 was used for alignment and stacking. Registax was used for wavelet processing. RRGB registration and combination was done in WinJupos. Final processing was done in Photoshop CS5/Topaz. Click on the image to see a larger version. 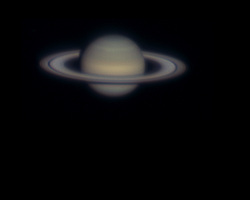 Saturn July 11, 2014 02:21 UT Dia. 17.7"
This image was taken about 9:20 PM under very good seeing conditions (8/10). Three minutes of each channel (RGB) was collected with a 60% histogram fill factor. This image was made with a 12" LX200GPS, Astronomik LRGB filters, TeleVue 2.5x Barlow and ASI120MM camera. FireCapture was used for camera control and video recording under the Windows 7 OS. Autostakkert 2 was used for alignment and stacking. Registax was used for wavelet processing. RRGB registration and combination was done in Photoshop. Final processing was done in Photoshop CS5/Topaz. Click on the image to see a larger version. 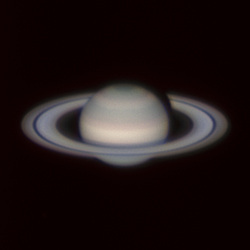 Saturn July 6, 2014 02:55 UT Dia. 17.8"
This image was taken about 9:55 PM under good seeing conditions (7/10). Three minutes of each channel (RGB) was collected with a 65% histogram fill factor. This image was made with a 12" LX200GPS, Astronomik LRGB filters, TeleVue 2.5x Barlow and ASI120MM camera. FireCapture was used for camera control and video recording under the Windows 7 OS. Autostakkert 2 was used for alignment and stacking. Registax was used for wavelet processing. RRGB registration and combination was done in Photoshop. Final processing was done in Photoshop CS5. Click on the image to see a larger version. Saturn June 30, 2014 03:15 UT Dia. 18.0"
This image was taken about 10:15 PM under good seeing conditions (7/10). Two minutes of each channel (RGB) was collected with a 50% histogram fill factor. This image was made with a 12" LX200GPS, Astronomik LRGB filters, TeleVue 2.5x Barlow and ASI120MM camera. FireCapture was used for camera control and video recording under the Windows 7 OS. Autostakkert 2 was used for alignment and stacking. Registax was used for wavelet processing. RRGB registration and combination was done in WinJupos. Final processing was done in Photoshop CS5. Click on the image to see a larger version. 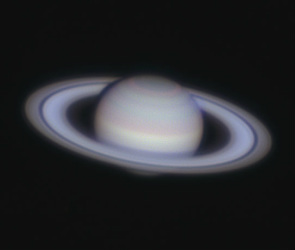 Saturn June 5, 2014 03:29 UT Dia. 18.5"
This image was taken about 9:30 PM under good seeing conditions (7/10). Three minutes of each channel (RGB) was collected with a 80% histogram fill factor. 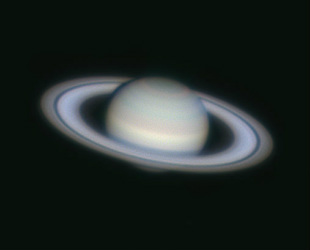 This image was made with a 12" LX200GPS, Astronomik LRGB filters, TeleVue 2.5x Barlow and ASI120MM camera. FireCapture was used for camera control and video recording under the Windows 7 OS. Autostakkert 2 was used for alignment and stacking. Registax was used for wavelet processing. RRGB registration and final processing was done in Photoshop CS5. Click on the image to see a larger version. 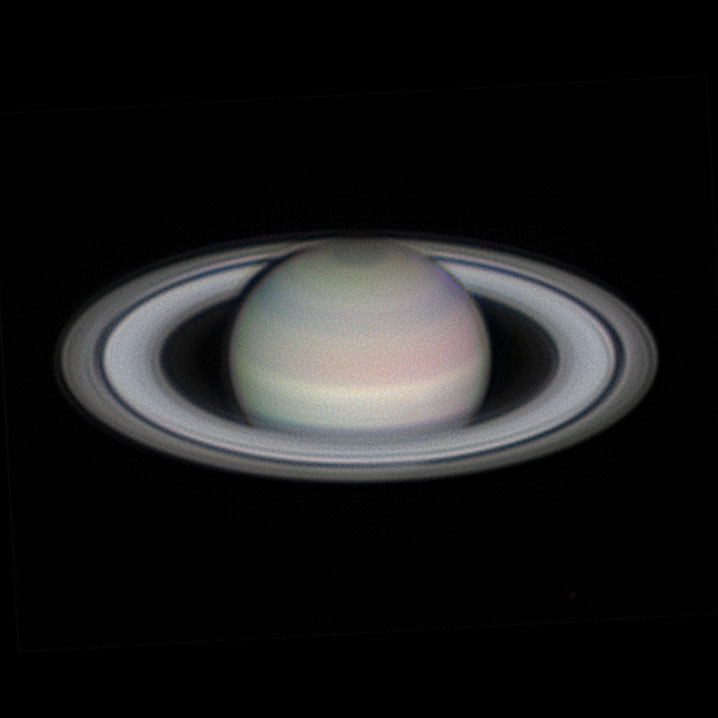 Seeing polar projections posted by other imagers using WinJupos prompted me to give it a try. 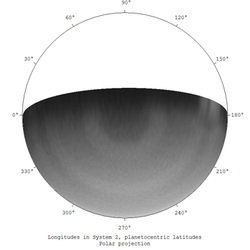 This is a polar projection of one of the better videos produced with a red filter on the night of July 9-10. 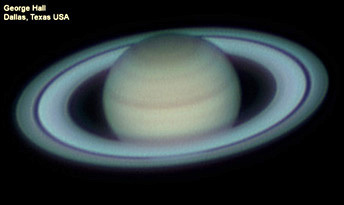 It leaves little doubt about the image having captured the Saturn polar hexagon feature. WinJupos is pretty amazing software! This image was taken about 9:40 PM under very good seeing conditions (8/10). Three minutes of each channel (RGB) was collected with a 60% histogram fill factor. 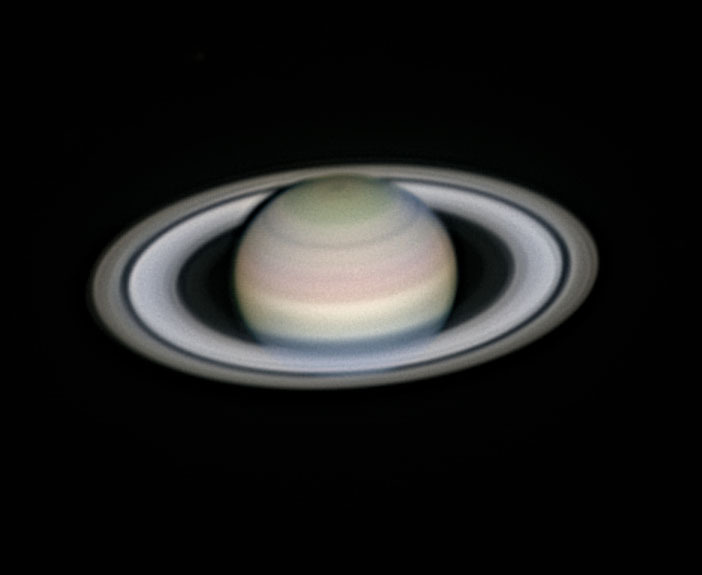 This image was made with a 12" LX200GPS, Chroma Technologies LRGB filters, TeleVue 2.5x Barlow and Flea3 camera. FireCapture was used for camera control and video recording under the Windows 7 OS. Autostakkert 2 was used for alignment and stacking. Registax was used for wavelet processing. RRGB registration and derotation was done in WinJupos. Final processing was done in Photoshop CS5. This image was taken about 9:40 PM under fair seeing conditions (6/10). Three minutes of each channel (RGB) was collected with a 55% histogram fill factor. 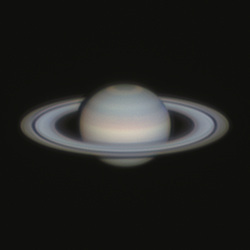 This image was made with a 12" LX200GPS, Chroma Technologies LRGB filters, TeleVue 2.5x Barlow and Flea3 camera. FireCapture was used for camera control and video recording under the Windows 7 OS. Autostakkert 2 was used for alignment and stacking. Registax was used for wavelet processing. RRGB registration and derotation was done in WinJupos. Final processing was done in Photoshop CS5. This image was taken about 10 PM under fair seeing conditions (6/10). Three minutes of each channel (RGB) was collected with a 55% histogram fill factor. This image was made with a 12" LX200GPS, Chroma Technologies LRGB filters, TeleVue 2.5x Barlow and Flea3 camera. FireCapture was used for camera control and video recording under the Windows 7 OS. Autostakkert 2 was used for alignment and stacking. Registax was used for wavelet processing. RRGB registration and derotation was done in WinJupos. Final processing was done in Photoshop CS5. Note: Being June in Texas, the temp. was in the mid 90's and the scope had been in my garage where it was probably over 100. 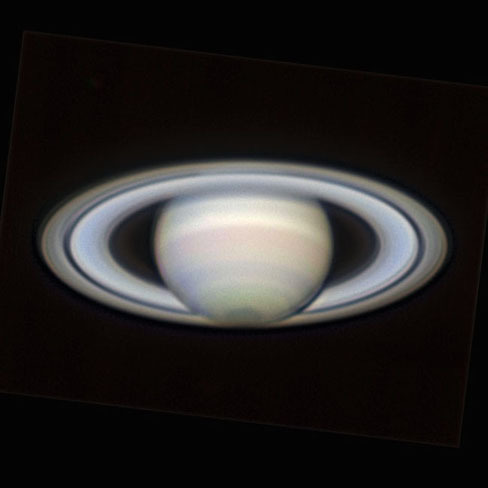 Saturn was at zenith when I first sighted it so there was just a short time available for good imaging conditions. This image was taken about 10:20 PM under good seeing conditions (7/10). Three minutes of each channel (RGB) was collected with a 55% histogram fill factor. 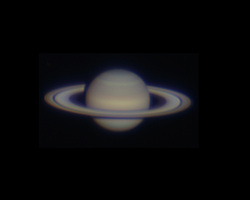 This image was made with a 12" LX200GPS, Chroma Technologies LRGB filters, TeleVue 2.5x Barlow and Flea3 camera. FireCapture was used for camera control and video recording under the Windows 7 OS. Autostakkert 2 was used for alignment and stacking. Registax was used for wavelet processing. RRGB registration and derotation was done in WinJupos. Final processing was done in Photoshop CS5. This image was taken a little after midnight under good seeing conditions (7/10). Three minutes of each channel (RGB) was collected with a 55% histogram fill factor. 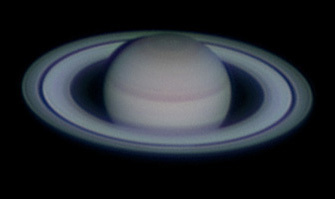 This image was made with a 12" LX200GPS, Chroma Technologies LRGB filters, TeleVue 2.5x Barlow and Flea3 camera. FireCapture was used for camera control and video recording under the Windows 7 OS. Autostakkert 2 was used for alignment and stacking. Registax was used for wavelet processing. RRGB registration and derotation was done in WinJupos. Final processing was done in Photoshop CS5. This image was taken about midnight under good seeing conditions (7/10). Two minutes of each channel (RGB) was collected with a 65% histogram fill factor. This image was made with a 12" LX200GPS, Chroma Technologies LRGB filters, TeleVue 2.5x Barlow and Flea3 camera. FireCapture was used for camera control and video recording under the Windows 7 OS. Autostakkert 2 was used for alignment and stacking. Registax was used for wavelet processing. RRGB registration and derotation was done in WinJupos. Final processing was done in Photoshop CS5. This image was taken about 6:30 am under good seeing conditions (7/10). Three minutes of each channel (RGB) was collected with a 65% histogram fill factor. This image was made with a 12” LX200GPS, Chroma Technologies LRGB filters. TeleVue 2.5x Barlow, and Flea3 camera. FireCapture was used for camera control and video recording under the Windows 7 OS. AutoStakkert 2 was used for alignment and stacking. Registax was used for Wavelet processing. RGB registration and combine was done in WinJupos. Final processing was done in PhotoShop CS5. This image was taken about midnight under good seeing conditions (6/10). The image is composed of the best 16,000 of 20,000 frames. The L frames were collected at 30fps. The R and G frames were collected at 15fps. The B frames were collected at 7.5fps. 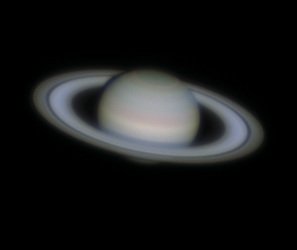 This image was made with a 12” LX200GPS, Astronomik 2c LRGB filters. TeleVue 3x Barlow, and Flea3 camera. Data collection and processing was done with Astro IIDC Mac software and Photoshop. This image was taken about 9:40 PM under very good seeing conditions (8/10). The image is composed of the best 3,600 of 7,000 frames. The L, R and G frames were collected at 15fps. The B frames were collected at 7.5fps. This image was made with a 12” LX200GPS, Astronomik 2c LRGB filters. TeleVue 3x Barlow, and Flea3 camera. Data collection was done with Astro IIDC Mac software. 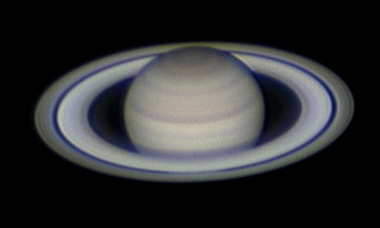 The image was processed with Registax 6 and Photoshop. Processing: IRIS: select (1200 for Lum), align, stack, wavelet processing, Photoshop: GRGB combine, unsharp mask, bright/contrast. Click on image for larger version. Processing: IRIS: select (1000 for Lum), align, stack, wavelet processing, Photoshop: GRGB combine, unsharp mask, bright/contrast. Click on image for larger version. Processing: IRIS: bias subtract, align, stack, wavelet processing, Photoshop: GRGB combine, unsharp mask, bright/contrast. Click on image for larger version. Processing: IRIS: select (1200 for Lum), align, stack, wavelet processing, Photoshop: GRGB combine, unsharp mask, bright/contrast. Click on the image to see the full size version.